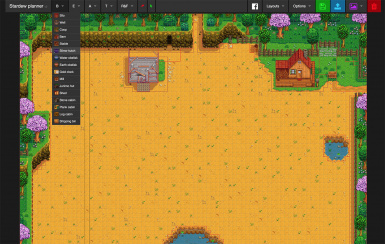 Online planning tool for Stardew Valley. Plan your farm on a coffee break, at work or while riding a train home! Make bigger profits by min-maxing or plan for an aesthetically pleasing farm. Planner is open source and licensed under Apache License v2. Added OS X executable to downloadable files. Windows version coming soon. 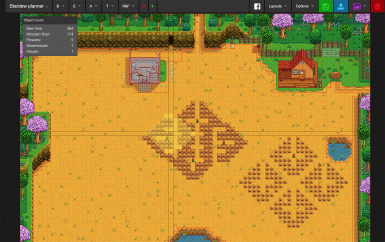 The planner offers a 2D planning grid for official and most popular community made maps. Figure out where to place paths and where to grow these beautiful ﻿starfruits. 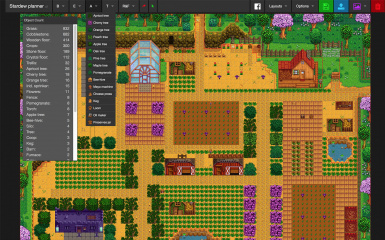 Place, drag, delete and move all Stardew stuff on your farm! Plan for any of the seasons, has all the crops from all the seasons. Possibility to save & share your farm so you can discuss your ideas in forums / chats. The planner also has a Facebook group where people share and discuss different plans and farm ideas! 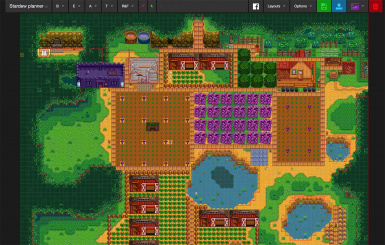 You can also find us from Stardew Valley Discord﻿ in #stardew-planner channel.